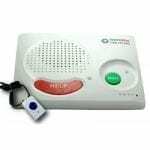 We’ve provided safe, reliable In The Home protection for years using traditional landline-dependent medical alert systems but with today’s seniors maintaining more of their independence than ever before, it’s time for that to expand. Meet Belle and Belle+, ResponseNow’s mobile medical alert pendants. Belle and Belle+ are shower-proof mobile help buttons designed to be taken wherever your busy life takes you. Belle uses the AT&T cellular network to connect to an operator during an emergency, while Belle+ uses the same network in addition to GPS information. Belle+ can also detect falls automatically. For more of the similarities and differences please see the chart below. After pressing the call button or when a fall is detected, the call will be made to a ResponseNow operator. Once connected the operator can do anything from sending emergency services to calling a friend or family member off of your predetermined contacts list. Belle+ can be located from an account-registered cell phone by texting “Find [customer’s first name as it appears on account]” to 96225. To register your cell phone with this ability please call 866-795-4321. The ResponseNow system will text back shortly after the request has been made with the location of Belle+ assuming that unit has power. Please note that requesting tracking for a device places a larger draw on the unit’s battery. It is recommended to charge more frequently if the device is being regularly tracked. 1) Press and hold Belle's call button until the call light turns blue. 3) Operator will answer the call by asking if you are OK.
4) Operator can send any help you may need including emergency services such as the fire department or an ambulance, or can contact a friend or family member on your behalf. Test Belle as often as you would like! There is no charge to test. *Call time is determined by the available cellular coverage in the area from which your call is being placed. 1) Plug charging cradle into electrical outlet. 2) Place Belle / Belle+ in charging cradle. 3) Keep Belle / Belle+ on charger for three hours to fully charge battery. Text message and/or email notifications can be setup to inform you or a contact when it's time to charge. To setup these notifications, please contact customer support at 866.795.4321. NOTE: Charge Belle / Belle+ immediately upon receiving the device to ensure you have a full battery. NOTE: Belle can last up to 30 days on a single charge. Belle+, due to its fall detection and GPS capabilities, lasts up to 5 days on a single charge. • Fall detection available only with Belle+.